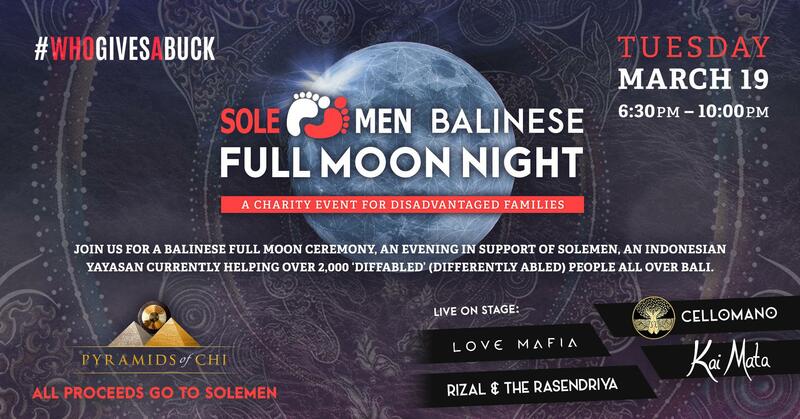 Join us for a Balinese Full Moon Ceremony, an evening in support of Solemen, an Indonesian Yayasan currently helping over 2,000 ‘diffabled’ (differently abled) people all over Bali. The evening will begin with a Shamanic Fire Ceremony under the full moon light where we will commit our intentions and prayers to the sacred flames for those families suffering in Bali. From there we will enter the sacred space of the Pyramid of the Sun for a 1-hour Ancient Sound Healing. Be lost in the mythical and ethereal sounds of gongs, drums, didgeridoos and Tibetan bowls in this deeply meditative experience. Continuing the evening, the Pyramids Café will serve up a tasty 3-course buffet meal while inspiring speakers and storytellers take to the stage including Solemen founder and philanthropist, Robert Epstone and head of Outreach, Sarah Chapman. Raising the roof of the Pyramids Cafe will be local musicians Love Mafia, Rizal & The Rasendriya, Kai Mata and Cellomano, each with their own brand of jams to get the crowd moving. Come along for an evening of entertainment in the name of charity. All proceeds go to Solemen, an Indonesian Yayasan currently helping over 2,000 ‘diffabled’ (differently abled) people all over Bali.